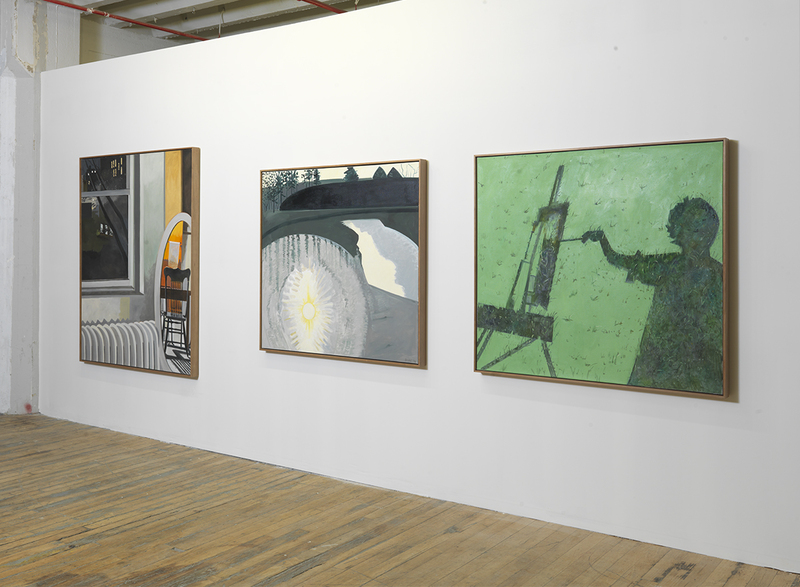 Lois Dodd says she’s not an artist, but a painter. There is a knowledge that comes from making things. It cannot be reproduced by history, or philosophy, or criticism. Artists often say their hands are smarter than they are. She is a painters’ painter. Her work is a resolute refusal to conform to social, political, or theoretical pressure. That’s why she works in Maine. Lois Dodd, L to R: “Night Sky Loft,” 1972. Oil on linen, 66 x 54″. “Winter Sunset, Blair Pond,” 2008. Oil on linen, 48 x 52″. “Shadow Easel,” 2010. Oil on linen, 48 x 54″. Courtesy of the artist. Photo by Brian Buckley. Her paintings contain the labor of domestic life: the laundry hung up, the hydrangea out back, a clean house, an empty room. She keeps making paintings regardless of what is written. Her attachment is to process. She paints outside even when it’s cold. The clear view outside through the window, the knotted branches of a familiar tree, the texture of the wood, she never stops looking. Quickness, the thinness of the paint, an economy of marks, and extremely limited means define her paintings. There is poetry in them, hard-won from hours of revision. She is not romantic. She paints in the same place for years, now over 60 dedicated. Her images—familiar vistas, the architecture of the rural suburb—are detached from sentiment by the work of actively observing from life. All of the attachment to place, all of the emotion in the weather, even their content as images is drained out, removed by repetition. Nothing is left but the daily practice of painting.